If you are drinking protein shakes it may be time to shake things up a bit with some other ingredients that will improve your workout goals and provide you even more nutrients so you can become the best you. Check out our list and put these in your next smoothie today. Bananas are cheap, available at nearly any store, and make for one of the most awesome protein shake add-ons you can find. Bananas have pre and post-workout benefits and are a great food to improve your calcium levels. Before a workout, bananas can give you a quick does of energy and help to sustain your blood sugar. During workouts this amazing fruit helps to protect against cramps and prevents nighttime leg cramps for those tough leg workouts. In addition to all the health and workout benefits of the banana, it also makes your smoothies creamy and delicious. Drink my avocado? What? That’s right, one of the healthiest “superfoods” in the world is the avocado. Like the banana, it makes your protein shake super-creamy and, also like the banana, provides a ton of potassium. Avocados also are a great source of healthy fats, a necessary part of the diet according to Registered Dietician Nutritionist Sofia Gourlides of the Good EATS Meal Planning Program. Avocados have also been shown to help you absorb other nutrients better, making it the ultimate companion in your protein shake. Check out some great avocado recipes and learn more about the other benefits of the avocado. You may already be infusing your protein shakes with peanut butter but did you know that almond butter is superior to peanut butter on almost every health aspect? That’s right, the creamy high-protein addition contains more of bone-strengthening minerals magnesium, calcium and phosphorus and healthy fats than the more commonly-used peanut butter. It’s a bit more expensive than peanut butter but if you are looking for maximum health benefits, almond butter is a great addition to your protein shake. Back in the day the ancient Aztecs used to run from village to village to deliver messages. Their main source of sustenance? Chia seeds. Chia seeds have gotten a lot of exposure as of late because they seem to be the greatest miracle food of the last decade. In addition to containing a ton of healthy omega-3 fatty acids (a heart healthy resource), these seeds are great for regulating blood sugar, are helpful at stabilizing metabolism, contain a generous does of minerals calcium, phosphorus and magnesium, and provide about one-third of your recommended source of fiber in just two tablespoons. While you can throw some chia seeds into your protein shake and blend, the best method is to allow the seeds to soak in your liquid for 15 minutes before blending. This allows the seeds to become more easily digestible and is said to unlock additional nutrients not provided if left hard. Greek Yogurt, much like bananas and avocado, helps to make your protein shake delicious and creamy. Plus it provides an added kick of protein, healthy doses of bone-building calcium, and probiotics, those organisms that help to improve your gut ecology. When choosing a Greek Yogurt for your shake, opt for the plain kind, like Fage or Chobani, which tend to have no added sugars or undesirables. 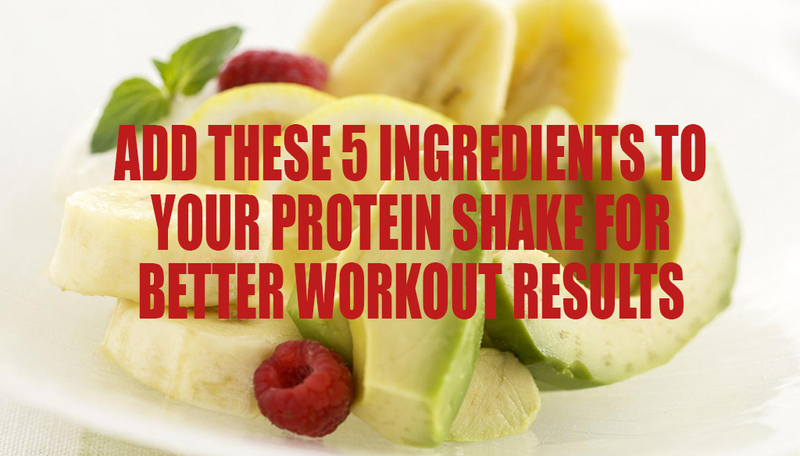 When adding ingredients to your protein shakes, you’ll want them to enhance its nutritional benefit on your body. There are 100s of protein shake combinations but you should be conscious of what you are putting into your drink and why. The above recommendations are great for muscle-building, stamina, antioxidants and natural sources of protein to complement your protein powder.